This is the fifteenth year that the P-R-O Convention has been providing usable choreography to professional cheerleaders and dancers. Few such business endeavors endure that test of time and that is testament to the people behind this effort and the nature of the service they provide. I think it is because of their love of dance and their passion that this convention has endured so long. I have been coming to this event since 2010 and every year, I challenge myself to get the best images that I am able and to capture the spirit of the dancers and choreographers that make this event special. It is grueling work, but it is my passion that makes me strive to be the best I can be with respect to documenting this wonderful event and it is this desire that keeps me coming back each year for more…nine years and counting. The P-R-O Convention is the premier professional cheerleading convention and over 250 dancers from all over the country gathered in Atlanta, Georgia for two days of intensive dance training and team building. This year, we celebrate the 15th year anniversary of the P-R-O Convention. And if you weren’t in Atlanta, keep on reading to see what it is like to be a part of this wonderful event. UltimateCheerleaders.com was given exclusive access by the organizers of the event, All-Pro3. For our readers who have never attended a dance convention, the following report will give an idea of what goes on during a weekend of nonstop dance action. With registration set to begin at 9:00 am, my plan was to get up early and set up an hour before registration to get some candid and posed photos of the cheerleaders as they filtered in. I usually get up around 7:00 am, shower and get a nice, lovely breakfast at the Collage café to start off a long day of work. But…I overslept and woke up at 8:30 am. I was exhausted the night before from flying in from Los Angeles on four hours of sleep and in my weariness, I set my alarm for 7:00 pm. It is truly amazing at what your eyes sees and what your brain comprehends when you are sleep deprived the night before the biggest photographic event of the year. Fortunately, my inner mind must have sensed my desperate plight and stirred me to wakefulness just in the nick of time that I needed to wake up, take a quick shower, and rush downstairs. What an auspicious (sarcasm) beginning to my P-R-O Convention. And this was just the beginning of my weekend of misfortune…you see, right when the dancing began, I realized that my external battery pack for my flashes was dead…and this normally reliable and vital piece of kit that had never failed before…failed. Oh well, I would just have to rely upon the batteries within the flash itself to carry on…fortunately for me, I had two flashes. That was until I heard a strange pop that I soon realized was the sound of a xenon flash tube exploding…you know, they make a rather distinctive sound when they break. So make that…one camera flash…I had one camera flash to last one more Saturday session and all day Sunday. Did I mention that I normally take around 8,000 images for the weekend…hence the two flashes and an external battery pack. So, for the remainder of the event, I would have to be cautious and try not to “machine gun” my shots…that might have pushed my lone flash over the edge. Anyway, that’s how my convention started off…but I digress. So, I made it down to the convention registration area around 9:05 am and got myself set up. I started to shoot some background photos and began selecting a few cheerleaders to profile for my P-R-O Convention All Star features. I was able to snap a few photos of there girls queuing up to purchase some convention wear at the P-R-O Convention table. Those girls who have been here before, got into the queue early because popular items sold out quickly and as every cheerleader knows, you don’t want to miss out on this year’s hottest convention styles. The Line Up is a provider of custom dance costumes and creative performance apparel. 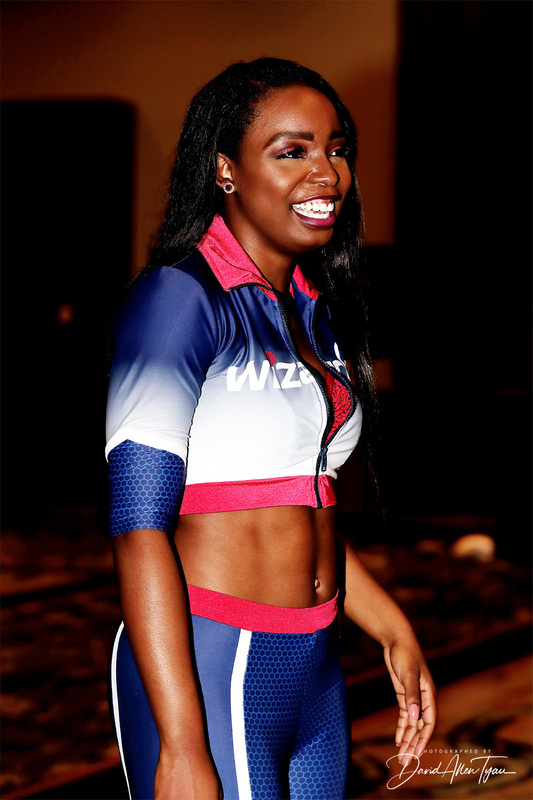 Their uniforms and performance apparel are worn by the most notable professional dance teams, such as the Minnesota Vikings, Washington Redskins, Houston Texans, Tennessee Titans, Baltimore Ravens, and the Wizard Girls. Satin Stitches, another major player in the custom uniform business, was in attendance and showing off some of their uniform designs. Satin Stitches provides uniforms to several professional dance teams as well as serving the high school, college and skating markets. Pastry shoes was showing off their line of dance sneakers that have become popular with many dancers. Pastry’s distinct quality features and passion for innovation have established the brand as America’s #1 Dance Sneaker for professional and university dance teams. A little before 10:00 am, the doors to the main ballroom were opened and the attendees were allowed to enter. Teams rushed in to claim their spot on the dance floor and this is a competitive event in itself because the most coveted locations are in the front of the dance floor…and no one wants to be in the back. We were on a tight schedule and shortly after the doors opened, the instructors were announced to their usual fanfare. 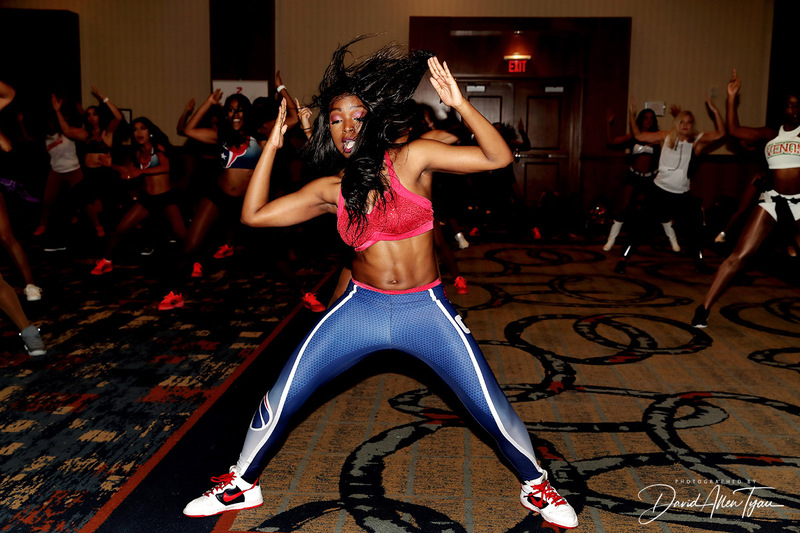 This year, twelve instructors were listed on the program and they represented the very best choreographers in professional dance, from NFL teams to NBA teams and all sports teams in between. Stacie Kinder of the Tennessee Titans Cheerleaders started off things by leading the group in a vigorous warm up and stretching session. And she started things off with the damnedest thing I’ve ever seen at this convention. The group dance is the first official dance that is taught at the convention and kicks off the festivities by getting all the participants together for one unified dance experience. 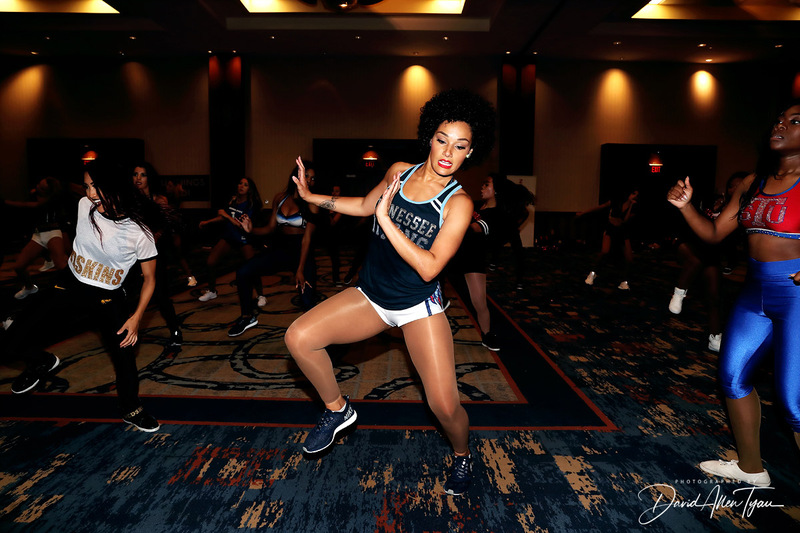 As is custom, Brandii McCoy of the Charlotte Hornets choreographed the group dance routine and showed it off to all those in attendance. After the group dance routine was taught, it was time to recognize this year’s Sideline Distractions magazine honorees. The names of the girls who made it through the selection process were announced and they were called up to the front of the stage to be recognized for their achievement. This year, two cheerleaders were selected as cover models…Leica from the Washington Wizards and Kristen from the New York Jets. Upon conclusion of the ceremony, the Sideline Distraction magazine was distributed and this was important because the girls not only got to check themselves out but, because it also included the schedule of instruction. This year, there were 26 classes offered featuring a variety of dances (jazz, hip hop, country, funk, old school, classic rock, holiday), and fitness/meditation classes. At noon, the first breakout sessions of the day began. Jakene Ashford choreographed a old school funk dance in the main ballroom. In room 2, Denise Garvey demonstrated a novelty dance. In room 3, Kristina Ferdig showed off a sassy, jazzy pom routine. And in room 4, Stephanie Jojokian taught a straight up jazz/hip hop routine. Each session lasted approximately an hour and fifteen minutes and that was just enough time to learn a one and half minute dance. At the conclusion of the session, the girls reconvened in the grand ballroom to showcase what they had learned. We broke for lunch at 1:30 pm. I used this downtime to ask some cheerleaders to pose for some photos for my P-R-O Convention All Star series. But this respite was all too brief and I could have used a few more minutes of quality time with the girls. After the lunch break, it was back to the dance instruction. It was 2:45 pm and the girls had already endured a full day. In this session, there were four classes taught: Stacie Kinder – “thrash country”, Derric Whitfield – novelty, Tara Battiato – rock jazz, and Ginger – jazz/kick line. Once again, at the conclusion of the session the girls gathered in the grand ballroom to showcase their new dances. At the conclusion of the Session 2 showcase, the girls were quickly ushered on to their final classes of the day. Four more dances were taught: Jerod Fewell– hip hop, Katie Gibbons – sassy jazz, Stephanie Jojokian – technique class, and Brandii McCoy – “street” jazz. At 5:30 pm the last showcase of the day had concluded and the cheerleaders reconvened in the grand ballroom to perform the group dance. I couldn’t remember many of the steps of the group dance, but from what I saw, the cheerleaders didn’t miss a beat. I guess that’s why they are professional dancers…they learn fast and remember what they have been taught. By my count, that was 13 dances and 6½ hours of instruction…just another a typical day at the P-R-O Convention. And in less than 14 hours, we would be back at it again. Up next: Day Two from P-R-O. Please check back soon. I want to take this opportunity to thank Brandii McCoy, Alto Gary, Tracy Rutledge and the staff of AllPro3 for allowing me the opportunity to cover the 2018 P-R-O Convention. I had a wonderful time and hope to be back next year.